Last month I started a new series, where I try whatever crazy trend is out there. I kicked things off with the Non-Touring trend. 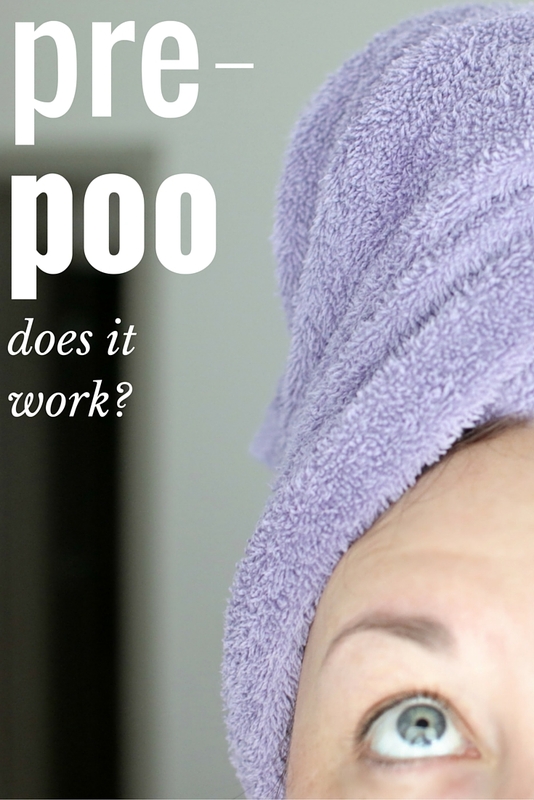 This month, it's all about poo, pre-poo that is. What does it do/why should I try it? You treat the hair before you shampoo. Pre-pooing keeps your hair protected from ingredients in shampoo that could strip it from moisture. 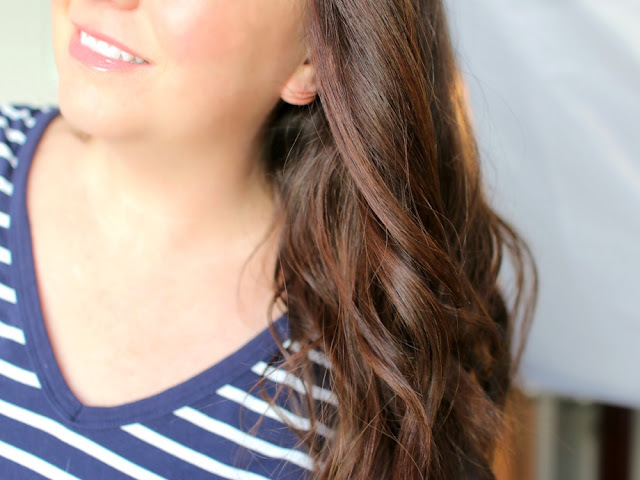 Curly hair (I know you're familiar with the no-poo movement) will love this. Apply conditioner to hair and let it set for around 20-30 minutes before rinsing away with water and then shampooing. You can also apply shampoo on top of the conditioner (after the conditioner has set for 20-30 min) and then rinse out. A leave-in or a bit of conditioner is still needed, especially for dry hair. Do you need special products for it? No, but I've seen pre-shampoo treatments from Living Proof, Madam CJ Walker, and Tressame (pictured below) on store shelves. You need a conditioner and a shampoo. I tried this for a month, using all sorts of conditioners and shampoos. My hair type is frizzy, coarse, dry, wavy, and fine--yes, all of those on different areas of my head, and none of them are curly. My hair was very moisturized, depending on products used, and my waves were more defined. My frizz was not as frizzy. I still needed styling products after. I noticed sometimes my hair got a little oilier quicker than usual. Overall, my hair felt like my hair usually does. Maybe a little softer--not a bad thing, especially helpful when I was in Cancun last month. Maybe a little more volume, but not a huge change. My first thought was, this is what I do when I'm at the beach anyway! I wet my hair and leave conditioner in it all day. My second thought was, 20-30 min? Every time I wash? Ugh. My third thought: isn't this like reverse washing? I know I'll get comments to just use sulfate-free shampoo. 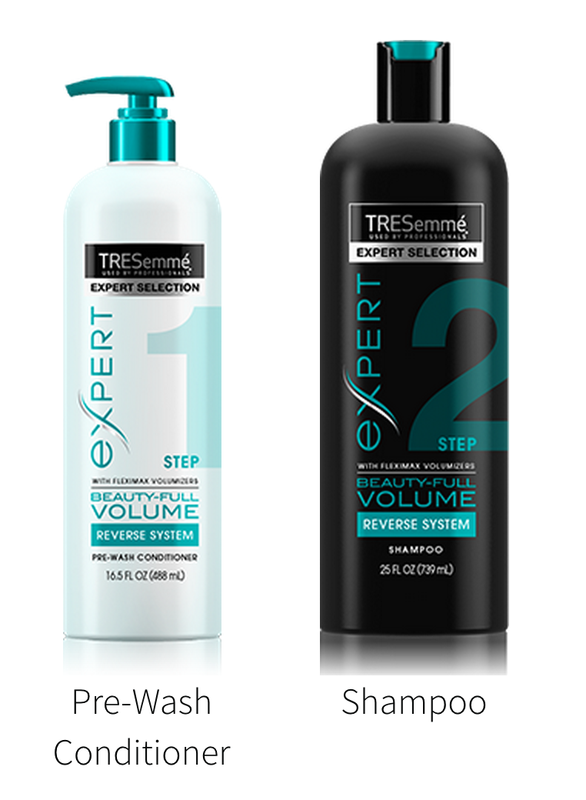 Depending on the brand, those either dry out my hair or make no difference on my hair. After a month of trying, I am not going to keep pre-pooing. Waiting 20-30 minutes and then shampooing? Ain't nobody got time for that!! I'll do a mask or a hot oil or hair treatment instead. Glad I tried it, but it's not for me. What beauty trend should I try next? -Finally had to admit after a year that I lost a Netflix movie. -Did you see this Instagram pic? I shared some pretty new things. Thanks for sharing this! Waiting 20-30 minutes is a lot of time. I would go with a weekly mask or treatment instead too! I've never even heard of this trend, but you are right, it does sound too time consuming. Thanks for your honest review and I am loving this series! Can't wait for the next one! I have never heard of this trend! Although, I'm with you. 20-30 minutes each time I wash my hair is a lot. I guess I would consider doing it if it gave my hair a ton of moisture (I have super dry hair too) but even then, I don't know that I could commit to each time I shampoo! Such a fun series, Elle! I've been thinking of trying this - it's great to hear about your expeirences! Yeah, I won't be trying this, but I am glad to know what it is. Elle, I feel you keep me up to date on what all the cool kids are doing! Its funny how trends & ideas change. I think I'll just stick with my routine. I aint got time for that either. Lovely locks. Thanks for sharing! Thanks for the review. I hadn't heard of this, but 20-30 minutes every time sure sounds like a lot. Uhmm, this sounds like reverse hair washing to me. Seriously beauty trends are getting out of hand, I think we should just do whatever that suits us best. I don't think I could do the 20-30 minute time commitment either! 20-30 minutes is way too long for every time I wash my hair. But I try and leave my masks in overnight if I know that I can wash my hair in the morning. To be honest I don't think I have ever even heard of pre-poo but the name makes me giggle! Ya 20-30 min you have to leave it in?! No way haha! 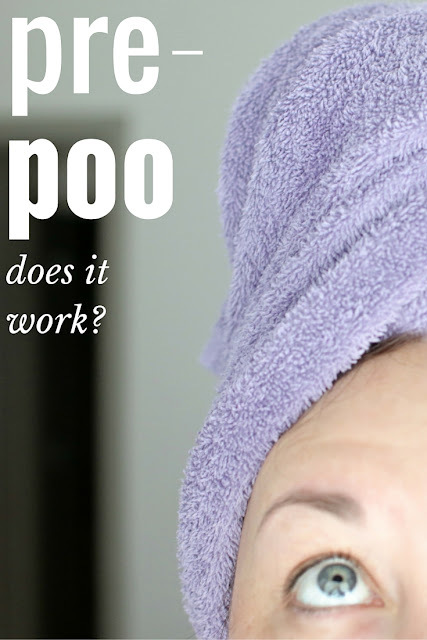 I haven't tried this but I did try No Poo shampoo and hated it. I thought it was just me but sulfate free shampoo totally dries out my hair. I have fine frizzy curly hair but for someone with fine hair, I have alot of it. The older I get the more curly my hair gets. I definitely don't think that I'd have enough time in the day to do pre-pooing! It seems like a great idea though if you struggle with dry hair and have enough time to do it. You always teach me something new! Conditioner tends to weigh my hair down so I'll have to try this! I've never hear of pre-shampooing. It does sound like an awful lot of time with not many results. Hmmmmm I don't feel like waiting 20-30 minutes before I shampoo so this wouldn't be for me. Unless you were reporting amazing, life changing results anyways. Thanks for testing this out so I don't have to! That is a lot of time to spend every time you wash your hair. I've done it in the past, but I didn't notice much of a difference either. The title of this made me giggle. This seems like a waste of time to me too. I only wash my hair once a week and do a treatment mask every time. Your hair looks beautiful! I hadn't heard of this! But yeah, an extra 20-30 minutes? Ain't nobody got time for that. Especially on work days--I'd have to give up sleep! Who has time for all that?! I barely have enough time for deep conditioner! NONE has time for that! LOL. Another gimmicky thing that I will be skipping! Thanks for trying it for us all though! I'm with you--I just don't have the time for that!! Also, it just kind of seems like a waste of products. Glad you tested this one out Elle! I tried this a long time ago when Kerastase sent me their pre-shampooing line, I didn't think it did anything different to my hair. But my hair is pretty normal...slightly on the thin side with no volume. I've been curious about this trend! Glad to hear it's not worth your time because I definitely don't have time for that! Yes I agree that is way too long, and my hair is too thin, it would be a greasy mess if I did this. And btw your hair looks amazing in that last shot. I'm on the same page, I would not have time for that! I've always wondered if doing it that way worked, though, so thanks for the great review. great experiment, but yea it's time consuming. Love reading your thoughts on pre-pooing! But, that's a long time to wait before shampooing, ha ha. Elle, I completely agree - aint nobody got time for that! I've been doing this. I do a hair mask on Sundays and leave it on 20-30 minutes. Then, I rinse and shampoo. This has allowed me to go an entire week without washing my hair. I use dry shampoo, but my hair doesn't look or feel weighed down. It's amazing! I used to pre-poo before pre-poo was cool. I'd just apply the conditioner first thing in the shower the the shampoo after I wash everything else. It helped when I had super long (super curly) hair. Now that my hair is shorter I just poo-con. Not for me either, but I am glad you tested it for us :) Just yesterday I was thinking about that; I bought some gifts to some friends and one was a Pre-wash, not the same as pre-pooing, but I thought "is it needed?" I am glad I read your review! 20-30 min are a lot, indeed! I saw pre-poo and thought of...well, you can imagine. I have a dirty mind. Anyway, maybe I'll try this. My hair does need help. I wish I had that kind of time, right?! 30 minutes is way too long! I actually do a pre-poo treatment with good old coconut oil when I'm in my bath. It's like killing two birds with one stone since I'm usually in there for at least a half an hour anyway. It makes my hair way more manageable. Best thing in the world. It helps me so much and you don't have to be limited to conditioners, I used coconut oil sometimes. I've actually been doing that for years with hair masks! I have fine hair and they usually weigh it down, so I always apply my hair masks before shampooing. I also do it with oils. Dang! So I had a sample of this stuff a while back and I thought it was nice, but wasn't something I needed in my life. I do a hair mask once a week, but I couldn't imagine doing this multiple times a week! I'm glad you gave this a shot- but I'm with you, adding 20-30 minutes to my hair wash routine just isn't feasible. Maybe once and a while though, when my hair is pretty dry! Waiting 20-30 minutes every time is crazy! That definitely wouldn't be worth it to me either. The idea is definitely nice, but who has time to use a pre-wash for 20-30 minutes every time you wash. I hadn't heard of pre-poo, but likely wouldn't try it either. A hot oil treatment sounds fab! Fun! I'm so glad you're out there trying these new trends so we can decide whether or not to try them, too! Your hair looks gorgeous! I might occasionally pre-poo (OMG this name...) but I agree, I can't imagine spending 20-30 minutes doing this every day! Thanks so much for trying! I've never heard of this before today and i have to say that I agree with all your first thoughts! Also, I can't believe you tried it for a month already!! That's dedication! Your hair looks great but the thought of leaving in the conditioner for 20-30 minutes every time is crazy! Great review girl! Umm yeah, not for me either. I am definitely not waking up an extra 20-30 mins earlier just to leave conditioner in my hair... Pfff! Wow I have never heard of this before the name does take some time to get used to lol. I would definitely try this out but I don't think I would have the patience to add an extra step in my hair routine. Girls with natural hair have been pre-pooing for years. It is time consuming but worth it for many girls with natural hair texture. It's not for everyone. But girls with my hair texture have been doing it with much success forever. I would totally try this, but my hair sounds similar to yours and it seems like a bit more work and time for only limited results. I see this product totally suit your hair. Nice. I haven't heard of this trend before. Definitely interesting! Thankfully sulfate-free shampoos work for my hair type. Waiting 20 minutes every time I washed my hair would be quite the hassle! I can see why you decided not to stick with this trend.